I explained him about the special feature I was planning on SRK and how it would be great if he could dive into the glorious past and talk about the fond memories he has shared with his most famous pupil. But Barry sir, this is the first time I am calling you and it is a special occasion in SRK’s life,” I protested. ” I wish him well. But I have nothing more to say,” Barry added before ending our brief conversation. 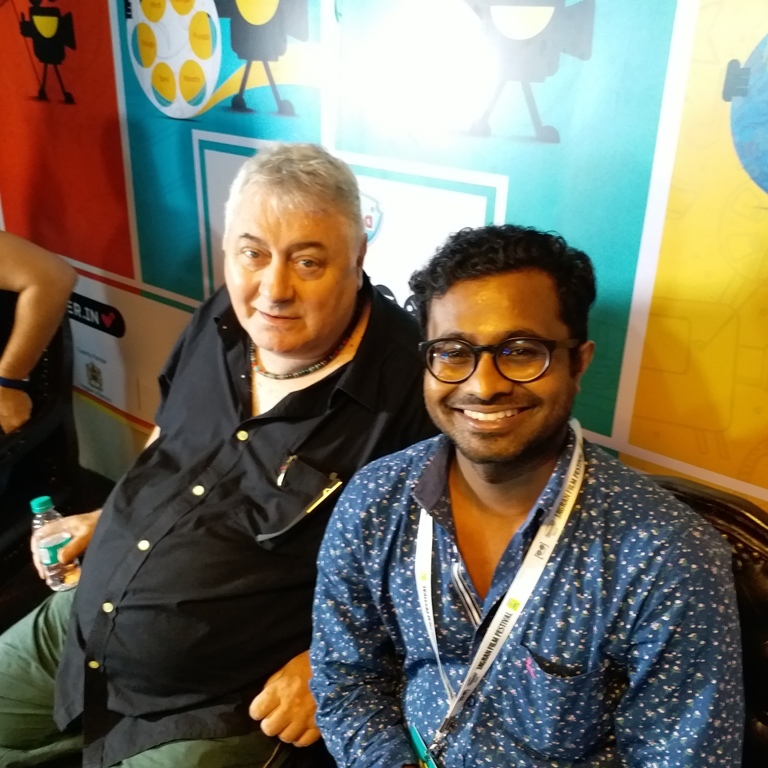 Fast forward to 2017 at the 8th Jagran Film Festival, I had the opportunity of meeting the man himself widely regarded as the finest acting guru in India. The interview was scheduled post his one hour workshop that he conducted for all the acting aspirants who braved the torrential rains to be present at the venue. After the workshop, I was ushered into a room where Barry was seated flanked by two of his students from his academy. I introduced myself as Sonup. “S..O..N…U…P….It is Sonup sir,” I corrected him. “Oh I will surely pass on your message to my parents,” I answered. Q: What’s the pre-requisite needed for becoming an actor? Barry: It is a long list but to sum up you got to look at yourself. You have to find out about the world of acting and what actually is involved. Many of us are still living in a dream world. We dream about becoming film stars and becoming rich and famous. You got to move way beyond that. If you want to make it your career, you got to move beyond that dream world and live in reality. You have know how films are made, what it takes, how much money is involved and how much time it takes…what is acting. There is so much to learn. You have no excuse not to go to the internet and find out the answers for all these questions and gain knowledge. And if you want to spend your life acting, you very well find out what is acting all about. Q: Not many actors who started out with theatre return to it after making it big in films. Why do you think that happens? Barry: That’s their choice. May be they get used to being paid so much more. But there many who do return…at least in the West. Here we have Shabana Azmi, Kulbhushan Kharbandaand a few others doing theatre. I don’t know anyone who doesn’t value and appreciate what they have learnt in theatre. It is a different ball than standing in front of the camera. It is live audience and it is more thrilling to get instant feedback. Do you rue the fact that there are not many trained actors doing films today? Barry: It is surprising isn’t it. I mean you think now with so much more money at stake and demands of producing more skills and artistic projects, it should have happened. Technology though has managed to keep pace. I can’t explain why we still don’t have so many trained people enough in a major film production or in a professional film.They are not trained at all. They have never even seen a training school or acting school. They have never even acted in a play just because they are somebody’s niece or nephew. Q: So it is nepotism all the way? Barry: Yes, ofcourse. Very much so. It is very much a monopoly. Everyone knows that Bollywood film industry is monopolistic meaning it all happens here in this city and nowhere else. Our films travel to Europe, America, China. They travel everywhere but they are made here. There is a complete family monopoly over film production which I am not sure is a healthy thing. Q: So what could actors do to break this monopoly. Long time ago, a Shah Rukh Khan did that in 90s. Do you foresee anyone doing in today’s time and age? Barry: Who has done it since SRK? No one. Roles are very few and the space is very limited for these stellar types. But there are other films being made which is nice to know. The more independent and experimental kind of pictures which stars will not be interested in doing and will not take the gamble of doing since they not it is not a sure fire success but younger more adventurous actors would. And they do. Q: Talking about younger actors, you have trained star sons like Varun Dhawan and Dulquer Salmaan. How do you see them? Q: You have trained Dulquer Salmaan right? Q: Okay. Varun Dhawan then? Barry: Varun Dhawan yes, But he was a special case. Barry: Normally I don’t take children of stars or directors. They are a pain in the a**. Very difficult to deal with. Very temperamental. But having said that Varun Dhawan and Arjun Kapoor have been the only two star sons I have trained. They have been buddies for ever. So they joined together. They were fantastic. They were low key, played down who they were, fitted in very nicely. I had great fun with them. Q: SRK always credits you for the actor he is today. Why do you modestly decline from taking credit? Barry: Because it is a fact. Yes, we came together and worked in theatre. It was most enjoyable and beneficial to both of us. But then he moved out. He is on another planet today. I don’t have any communication with him. Q: Could share your memories of Theatre Action Group (TAG)? Barry: Memories of TAG are always really fond and precious. What TAG achieved back then was remarkable and that too without any sponsorship We had little support from ITC but now cigarettes can’t sponsor anything. But yes, TAG was phenomenal. Every year we could churn out 6-8 productions. Q: Any one film actor whose performance bowled you over in recent times? Barry: I was moved to tears after watching Manoj Bajpai in Aligarh. He invited me to a special screening and after the film I couldn’t speak. I hugged him. He had suddenly become so mature. It was an incredible character study he had performed without being violent, overt and in a very quiet yet so powerful manner.